An excellent old English dual purpose pear with very large exhibition fruit. 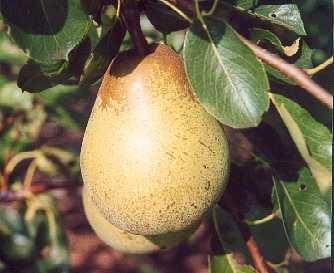 Putmaston Duchess pear was raised in 1841 by John Williams at Pitmaston, Wocestershire, UK from a cross between Duchesse d'Angouleme and Glou Morceau. A very large fruit with an average weight of more than 1 lb (500 g). Long conical to pyriform in shape. Smooth, pale yellow skin. Variable amount of brown russet and slight red flush. Creamy white, smooth, juicy flesh. Good flavour with a hint of acidity. Can be used both as a dessert and a cooking pear. Vigorous tree. Good to heavy cropping. A triploid and therefore ineffective as a pollinator.